If you are wondering about the success rates of dental implants, we invite you to read more and to visit our Glendale office to have all of your questions answered. 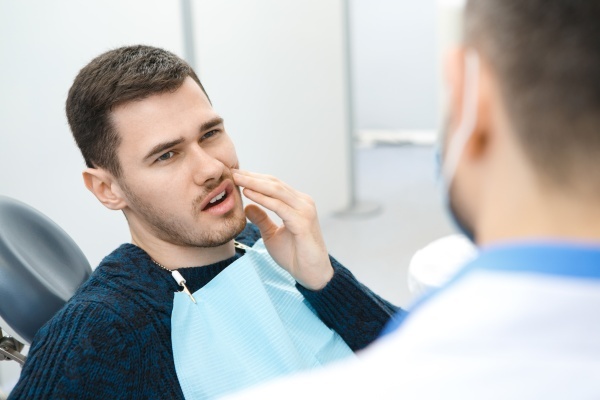 If you are one of the uncountable numbers of adults who have lost a front tooth due to injury, dental caries, or periodontal disease, you are probably very conscious of that unattractive gap. And missing molars can create problems with chewing. A partial denture, which connects to the teeth on either side, is one option to replace missing teeth. However, partial dentures can cause certain issues. Not only do adjacent teeth need modification to support the denture, but if we do not fit them perfectly, partial dentures can also put excessive pressure on the tooth at the wrong angle or traumatize the gum. They also often require frequent repairs and adjustments and can, over time, get very loose. On the other hand, dental implants are the closest you can get to natural teeth. They neither look nor feel fake and allow you to eat anything you wish and smile with confidence. An additional advantage is that dental implants have a very high rate of success and usually last a lifetime. Unlike dentures, we permanently fix dental implants to the jaw itself and provide a solid foundation for prosthetic teeth that look, feel, and function exactly like natural teeth. Although the procedure is more complex and takes several weeks to complete, implants rarely have the problems that can accompany conventional dentures. In this procedure, a small titanium or metal-free zirconium post is surgically placed into the bone under anesthesia. The implanted post acts as a substitute for the root of the tooth that is missing and provides a strong and stable anchor for the prosthetic that will be attached to it after the healing period. Although local anesthesia is usually sufficient, other forms of sedation can also be used. The gum is then sutured, which protects the implant from any pressure while it is healing. As the jawbone heals, it grows around and fuses with the implanted post, thus securely anchoring it in the jaw, a process that can take anywhere from six to 12 weeks. 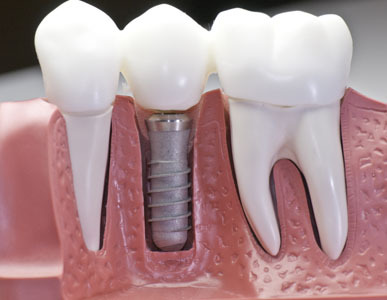 After the gum and jawbone have completely healed, and it is determined that the integration of post and bone is successful, an abutment is used to connect the implant to the replacement tooth. This is done by removing some of the gum and exposing the top of the implant. A prosthetic tooth, which closely matches your natural teeth, will be made from an impression of the abutment and then firmly secured. The success rates of dental implants are influenced by how experienced a dentist is at completing this portion of the procedure, something that we do on a regular basis. We complete dental implant procedures while the patient is under local anesthesia with very little discomfort. In fact, many say that it is less painful than having a tooth extraction. We can treat any post-surgery discomfort with over-the-counter medication, such as Ibuprofen or Tylenol. With a very high success rate, dental implants have some of the most favorable outcomes of all dental procedures. In fact, with proper care such as brushing, flossing, and regular dental check-ups, implants can last a lifetime. Dental implants also help prevent gum recession and bone deterioration that often occurs when teeth are missing.